From tech professionals to people fleeing the Trump presidency, Canadian Permanent Resident is booming and it doesn’t show any signs of slowing down. If you’re interested in relocating to Canada and need to apply for a Canadian Immigration. 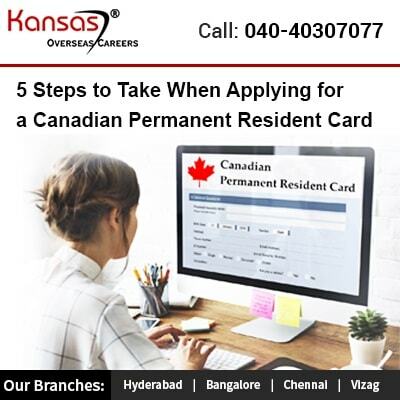 Listed below are five steps you need to follow to make the Canadian application process as simple as possible. New permanent residents do not need to apply for permanent resident cards. If you provide the Canadian government with your Canadian mailing address, you will receive a permanent resident card when you immigrate. However, if you didn’t receive your card within 180 days of immigrating to Canada, you will need to apply for one. Anyone who is immigrating to Canada is eligible for permanent residency, as long as they are physically present in the country for at least 730 days (2 years) out of the last five years, are not under a removal order, and have not been convicted of any offenses related to misuse of the card. If you do need to apply for a permanent resident card, you’ll need to obtain an application package. You can download application forms and then fill them out. Make sure you have your photos printed according to the specifications listed in the application. You must pay your application fee online with a credit or debit card. Once it’s been paid, you’ll need to print out your receipt and include it with your other application documents. Before you submit your application, double check it to make sure you’ve answered all the questions and have attached all the required supporting documents and receipts. You’ll also need to check to make sure you’ve signed everything. Once you’ve completed your check, you can send it by mail or courier to the Case Processing Centre. Now, all you have to do is wait for the application to get processed. The average processing time is 114 days. If the government approves your application, you’ll usually receive your permanent resident card in the mail. In some cases, though, you’ll need to pick it up at a government office. If this is the case, you’ll need to bring your passport or other travel documents, along with your original application documents. If you don’t pick up your card within 180 days, it will be destroyed and you’ll need to apply for a new copy. If more than six weeks pass (beyond the 114 average processing time) and you still haven’t received your card, you’ll need to send a solemn declaration to explain the situation and get a new card sent to you.